Do you see 11:11 and number sequences? Here’s my latest podcast on this spiritual wake-up call, hosted by my soulmate Kris Anderson with special guests John Le Gros, Caroline Byrd and Tracey Watson. Thanks to Conscious Wisdom, Latenite Media and 31Digital for this amazing opportunity to spread the light. 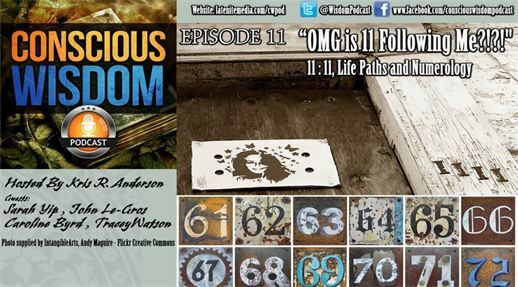 Listen to the 11:11 Conscious Wisdom Podcast (111min) Scroll down for a transcript. 11:11 Conscious Wisdom Podcast – Transcript (I’ve highlighted the numerology tips and added info – there’s even more material if you listen to the full podcast). 1:26 I give a brief rundown of 11:11 and why people see it. It’s a homing call – the more you talk about it, the more you’ll see it.People start to see 11:11 before a 5-10 year period of transition, often from a ‘normal’ to an alternative lifestyle. 2:18 Lifepaths pinpoint what we came to heal (Find your lifepath). 7:33 We discuss when we started seeing 11:11. I mention that I’ve seen it since 11.11.11, and how it’s the sceptics who get smacked in the face with number sequences (I have a science degree). When you research it online, your life begins to improve. You realise that millions of people see 11’s and that it’s a positive experience. Tracey (who is an 11 lifepath like myself), sees 11:11 as a message from the Angels and a confirmation that she’s on the right path. Just after she did a numerology workshop with me, she walked past a wall with 1111 on it, that she’d never noticed before! Kris had a friend whose partner kept waking up at 11:11 and started asking questions. Caroline believes that everyone sees 11:11 at some point in their spiritual journey – it’s not just for ‘special people’. About 18 years ago, she used to find her clock stopped at 11:11, with the batteries beside it. During meditation, she felt that her grandfather was close to death. The next day, a white haze passed her at work. At that moment, the phone rang and her father told her that her grandfather had passed away. It was 11.11am! She sees 11:11 as a sign that a change is coming. John (also an 11 lifepath) sees 11:11 and thinks it’s normal! I met him at an Australian Bush Flower Essences workshop on numerology (read Ian White’s numerology). We analysed the group and several 11’s were sitting in a row! Here’s a photo of us. 15:31 People with Master 11, 22 or 33 numerology may see 11:11 more intensely, because they have agreed to do double the work in one lifetime. It’s important to know your numbers, so that you don’t compare unfairly yourself with others. Instead of asking ‘why am I so unstable or flaky, e.g. changing jobs all the time’, embrace the fact that you’re just operating on a different timeframe. People often see 11:11 at the start or end of a Personal 9 Year cycle, or during crises (see my interview with Natasha Nanda), as it’s the light and love trying to get through. Find your Personal Year. 17:32 Tracey mentions that she is a 38/11 and one of her best friend is a 29/11. I discuss how people with similar numbers attract each other – my last house had three lifepath 1 men. Macho overload! Children often like their lifepath number without knowing any numerology. I mention the lifepath shift or maturity year – mine was 29 as I am a 29/11 – that was when I discovered numerology. Your lifepath shift year depends on the sum of your date of birth. This can be a year of changes, finding your purpose or realising that you’re off-track. The years after your lifepath shift brings a spiritual flowering – I became a professional psychic at 30. 20:14 11:11 appears when times are dark. The Sunspot cycle is 11.11 years. The words light, energy, etc. add to 11 (read more). 11:11 adds to 4, which represents love and the 4th or Heart Chakra. It’s a reminder that you are needed on the planet. Some people hide the fact that they see 11:11, in case they appear crazy, while others don’t care. I walked into a bank in Sydney, where a man was screaming out 11:11 at the top of his lungs. He didn’t calm down until I had a chat with him. 23:39 Kris discusses 11:11, Torsion Physics, sacred geometry and Richard C. Hoagland (who researched the Face on Mars). 25:31 Caroline talks about being a 5 Lifepath (Change, Freedom & Throat Chakra Healing) and receiving a message about her vibrational essences at 11:11. 26:48 John and Kris talk about acupuncture, vibrational healing, divining rods and auras. Also electromagnetic radiation and bush flower essences. 30:04 I talk about meeting Ian White, and taking Abund Essence for financial healing (read more money tips). After starting the essence, I wrote a wishlist of VIPs I wanted to read for. Within weeks, I found opportunities to contact Ellen Degeneres, who sees 11:11 (read more) and Natalie Cook (read more). Check out my VIP readings and tips for manifesting miracles. 31:30 I warn against becoming superstitious, e.g. thinking that 11 is the best number. 1 is about beginnings and 11:11 means that your life is about to completely change, and wherever that takes you is good. It’s the path of the heart. Don’t get too intellectual – do some numerology study, but don’t give your power away (e.g. only leaving the house at 11:11). 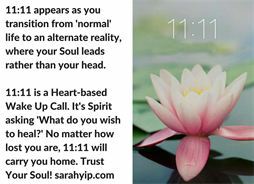 Develop a healthy relationship with your Spirit Guides and codes like 11:11 – expect the number sequences to come and go. It’s normal for them to change over time, as you ‘get the message’ and take action. 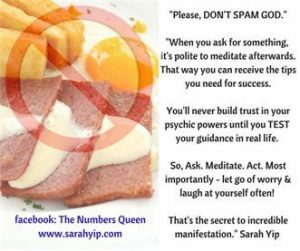 Seeing the same number constantly suggests you are not listening to your intuition – it might be time to meditate (see my tips here – under the section which suggests you Don’t Spam God – also listen to the podcast at 44:25). You are never a ‘victim’ of 11:11 or Spirit. 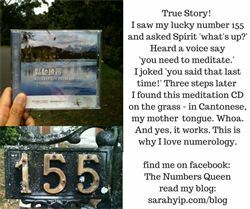 You are a powerful Soul who is here to co-create your dreams with the help of the Universe.If you tell Spirit to send you numbers, they will! If you ask them to stop, they will – unless you really need to connect with them (think of a parent looking for a lost child). 11:11 is one of the best things that will happen to you – once you start seeing it, you’re about to let go of a lot of emotional baggage (including past life issues). There’s more to 11:11 than just making a wish – you also have to follow through, as I wrote in this article. Kris and I then talk about the dark side of 11:11 e.g. people who use it online to convert people to their way of thinking, or to sell products…scary, huh! 36:05 Tracey talks about being an 11, and how there is a push-pull between the independent 1 and people-focused 2 energy. I mention that 11’s can appear to have a split personality. Master 11 lifepaths are influenced by the Moon and attract publicity. 37:47 Some people who don’t have Master Number numerology also see 11:11 – they are either at a Personal Year turning point as mentioned before, or they are here to work with those with Master Numbers (e.g. as clients, through their friends and family groups). They may also be Starseeds. Based on my readings as a psychic in Brisbane, many 11, 22 and 33 holders develop mental illness, eating issues, or become homeless etc. and they need special care to recover. High highs and low lows are the name of the game when you’ve signed up for double learning in one lifetime. We discuss seeing other number sequences like 10:11. Kris and I see this as he is a 28/10/1 lifepath and I am a 29/11 – we see it as a romantic sign. Caroline and Kris talk about waking up at 3.30, 4.15 or 4.30am and how this relates to the meditation and witching hour. Note from Sarah: In Chinese Medicine, this is also the time when the ‘Soul’ is thought to return to the body after resting. 40:46 John mentions that patients with double or Master Numbers – are more sensitive to healing, so he reduces their dosage. They also arrive with more health issues than average people – I wonder if this is because Master Number holders avoid asking for help! 43:52 11:11 represents the Age of Aquarius and the transition from from the Age of Pisces (where leaders created followers) to a world where leaders create leaders, and we share power (11 looks like an equals sign connecting Heaven and Earth). People who see 11:11 are part of this movement. 44:25 I talk about manifestation, The Secret and spamming God. You can’t just write a wishlist – you have to meditate to ‘check your Spiritual inbox’. Codes like double or triple numbers, or 11:11 suggest you have messages waiting for you. It’s important to take a moment to still your mind and receive the instructions. That’s how you strengthen your trust in Spirit and become more psychic. My Spirit Guide call sign is 155 (it’s different for each person, and usually not 11:11), and talk about how the last time I saw it I was told to meditate. A few steps later I found a meditation CD in Cantonese (my native language) on the ground! See photos to the left. Through meditation, you can ask your Spirit Guide for their call sign (it could seem quite random like 812, 155 etc) – it’s their frequency. I then talk about my mX paper experience, where the publication was shut down the day it published my article on 11:11 numerology (read more). 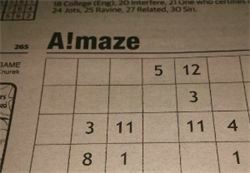 It seems I had sympathisers at the paper (see photo of the puzzle that day). I wasn’t sure a News Corp publication would run a psychic’s story – I figured they had filters that would activate a siren if an 11:11 ever snuck through. Maybe I was right! 49:39 Caroline, Kris, John and I talk about spiritual breakthroughs that come from losing a job, divorce or the death of a loved one. These events remind us that we have choices. The quality of your life is determined by the quality of the questions you ask yourself. You see 11:11 when your Third Eye Chakra (sixth sense and mind) is opening to a new level. At times like this, you realise that you’re the sane one, while the people around you have bought into government or social fallacies such as ‘you need to be richer or more beautiful to be happy’. This can lead to severe loneliness, where you feel like you’ve woken up from a dream – that’s why I relate 11:11 to people who are about to make major leaps of faith, such as chasing their childhood dreams after a corporate career. I met Kris just after we’d both started our dream jobs (mine in palmistry, his in TV directing). Here’s a video of our first meeting! See 3mins, 41s. You have to take risks to win big. I mention that some people who see the 11’s try to escape their lifepath or job description through drugs, addiction etc. It’s much easier to navigate the journey if you have even one true friend (Caroline was this person for me, so is Kris). Tracey mentions a recent car accident, which she knew was a sign to move on from her job to study numerology and astrology etc. We talk about synchronicity and 11:11. I clarify that seeing 11:11 is simply a hello – it could be a ‘hello, you’re about to fall down a hole’, or ‘hello, all your Christmases are about to come at once’ – it looks like a pause symbol and reminds us to stay present. I see red 11’s when I am approaching burnout. 1:00:00 to 1:16:37 I explain the lifepaths, including 1-9, 11, 22 and 33 numerology, based on the thousands of readings I have done since 2011, and Dan Millman’s book The Life You Were Born to Live(read my psychic reading for Dan). Find your lifepath here. Here’s a rhyme I made up, to go with this section. 1:16:38 I do a brief reading for Richard the cameraman, who’s a 27/9 Old Soul or Thinker lifepath. I normally prepare charts in advance, so this session jumps around a bit. Richard doesn’t say much on the show, but did correlate the timings afterwards, e.g. he went into TV at 27-28 years old and had an issue blow up in May-June 2015. 1:23:06 Kris and I met during a relationships palmistry workshop – it’s true, I read his hands and heard a voice telling me he’d be a good boyfriend (hehe). Read my tips on attracting love. When you do what you love, you meet equally passionate people. 11:11 reminds us that we attract what we are. I talk about how people with strong 11 energy or intention can short-circuit technology, and how you can influence IT using your thoughts. Once I was about to send a stalker my address, then I yelled at the computer to stop. It turned off and the email never sent. Another time, a bully went up to my friend’s computer, which had an email from me on it. My friend and I didn’t want her to read it – would you believe it, the computer burst into flames! 1:26:50 Kris, John and I talk more about radiation and how the headphones and broadcasting equipment is giving us a headache. John and I work with our hands doing healings or readings, so we pick up energies much easier than most people. 1:27:40 John finds that flower essences help to remove the heaviness he feels from technology. I mention using organites and crystals for protection. During readings, I ask my clients to put their phones on flight mode, partly because they interrupt intuition. Although mobiles are great for receiving signs like 1:11, 2:22 etc., the signals from Spirit and your Soul are like the sounds of a violin, whereas phone signals are like heavy metal music to me. It’s easier to do readings in a natural place, with someone who is rested, rather for someone who is stressed and seeing you in a shopping centre, for example. Caroline uses Reiki, flower essences and intention to move energy from her, so wi-fi doesn’t affect her as much. She says that when you just ‘know’ you are protected, things improve. She experienced heightened energies while travelling in India, including scarily accurate flashbacks of war in conflict zones. Kris talks about transmuting energies and how resonating at a high vibration prevents lower vibrations from attaching to you. Sometimes, it doesn’t matter how much you ‘lift’ yourself, you just have to leave a situation. People like me, who have ‘silk skin’ in palmistry, are psychic sponges (read more). We benefit hugely from energy clearing, taking baths, staying away from toxic environments etc. Not everyone is designed to live in urban environments, around people who hate themselves! Self-love comes from respecting your sensitivity, instead of blocking it. Kris is a very proactive 1 lifepath – he saved me by finding medicine when I accidentally ate cheese (I’m allergic). We complement each other – as an 11/2 lifepath, I’ve helped him to think about consequences, by switching to organic food. It’s better to give your money to farmers now, than to a doctor later on. Each case of cancer can cost $50 000+ in treatments and lost income (a statistic I learned while working for a cancer charity). 1:38:22 I explain compatibility in numerology – the sum of your lifepaths is the energy you create, whereas the difference between your lifepaths reflects the challenge you need to overcome. This can be helpful information for couples, parents and children – it encourages forgiveness and objectivity. Tracey talks about how numerology has helped her to move on from karmic relationships. I mention that it’s important to use your intuition first, then numerology as a backup. Stay in your power. 1:40:58 Tracey reveals that Richard the cameraman’s nickname adds to 9, which matches his lifepath. This is normal – numerology influences us, even if we don’t believe in it. My life is studded with 11’s, although I didn’t know I was a Master 11 lifepath until four years ago. My phone number for the past 20 years adds to 11, and I’ve lived at many 11 addresses (read more on house numerology). 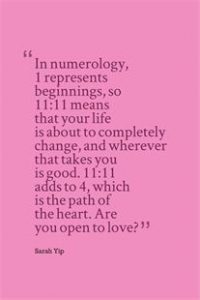 Numerology and 11:11 wake up calls reveal the Divine Order to life. No matter how lost you are, 11:11 will help you find peace again (see photo). Trust Your Soul! Keep an open mind – don’t blame your lifepath for your issues, as it’s only 50% of your numerology (the rest is made up of your name and other calculations). You always have free will. A car goes where its driver steers it. Tracey, Kris and I mention the history of numerology and Kabbalah. I use the so-called Pythagorean system (rather than the Chaldean system), which wasn’t actually invented by Pythagoras. Part of my job as a psychic is to dispel myths, e.g. that your Life Line in palmistry predicts your lifepath (it doesn’t – read more). 11:11 represents justice, heart-opening and people coming together – no wonder 11/11 is Remembrance Day (read more). Whew! That was a big post! Thank you for your support. If you like this blog, please join my facebook page The Numbers Queen. You’re welcome to post on the timeline. You can also subscribe to my e-news for articles (see homepage). Article about 11:11, triple numbers (111, 222, 333, 444, 555, 666, 777, 888, 999), 1212, 1234, 911 etc.